Be the first to share your favorite memory, photo or story of Wilfred. This memorial page is dedicated for family, friends and future generations to celebrate the life of their loved one. 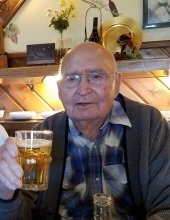 Wilfred Domnic Wagner, 90, Phillips, former Winter resident, died in the Park Manor Nursing Home in Park Falls on Friday, February 1, 2019. He was born in Coates, MN, on December 11, 1928, the son of William J. and Caroline L. (Keller) Wagner. He was married to Claudia Denn in the St. Dominic’s Catholic Church in Frederic, WI, on June 14, 1952. He served his country in the Minnesota National Guard, and was called to active duty during his time in the National Guard. He was a 32 year employee of the 3M Corporation in Cottage Grove, MN, where he was a Master Film Technician. He retired in 1988 and following his retirement he and Claudia made their home in Winter, Wisconsin. He was a member of Saint Peters Catholic Church of Winter, and was a member of the Prescott Volunteer Fire Department. In his free time he enjoyed hunting, woodworking, tractor restoration –especially International Harvester tractors, and travel. He is survived by his wife, Claudia; by five children, Katherine (Timothy) Hutchson, Red Wing, MN, Mary (Timothy) Derner, Waterford, WI, Carolyn (Anthony) Bonanno, Baraboo, WI, Michael (Linda), Galena, Ohio, and Anne (John) Baxter, Phillips; by 13 grandchildren, Robert, James, Kyle, Megan, Ashley (Hutchson), Aaron, Ethan, Anne, Lydia, Zachary, Maggie, Hannah, and Cecely; by 3 great grandchildren, Chase, Avie, and Cayden; and by four brothers and sisters, Leila Meyer, Larry (Pat), Fran Schneider, and Butch (Jeanine), all of Hastings, MN. He is preceded in death by one son, Richard; and by one sister, Luella Stoffel. Memorial services will be held at 11:00 A.M. on Saturday, February 9, at Saint Peters Catholic Church in Winter, Wisconsin, with Father Jerome D’Souza celebrating the Funeral Mass. Friends may call at the church on Saturday, February 9, from 9:30 until the time of services. Internment will be in the Saint Peters Cemetery in Winter, WI. To plant a tree in memory of Wilfred Domnic Wagner, please visit our Tribute Store. "Email Address" would like to share the life celebration of Wilfred Domnic Wagner. Click on the "link" to go to share a favorite memory or leave a condolence message for the family.